In another behind-the-scenes episode from Grand Princess dry dock, the hotel manager talks about his role during the dry dock. Daily updates of other projects around the ship are in Princess' photo journal. In this episode from the dry dock in the Bahamas, Martyn checks out the new sound system for Movies Under The Stars, and toasts a milestone - or two. There are more photos of other work going on around the ship in Princess' photo journal, which is updated daily. 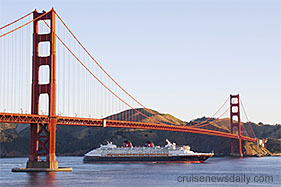 Disney Wonder sailed under San Francisco's Golden Gate Bridge this morning (April 29, 2011) as it arrived in the city for its first call there. Disney Wonder is in San Francisco for a two-day stay as part of a repositioning cruise that will base the ship in Vancouver for the summer for its 7-night Alaska program. In today's video from Grand Princess' drydock in Freeport, Martyn gives us a look at the updating going on with the ship's lifeboats, takes us around back for a view of the work going on under the ship, and talks with the man in charge of the 50 square miles of carpeting being laid on the ship. Just about every line is providing television coverage of the Royal Wedding on Friday. Many are also providing some kind of themed celebration, but none of them match the level which Cunard passengers will experience. This video will give you an idea of what Cunard's passengers can expect and what preparations have gone into it. In today's video from the Grand Princess dry dock features Martyn interviews the artist who is repairing damage to murals throughout the ship, and the production manager in the theater about the new equipment going in there. This isn't all the work that was done today aboard Grand Princess. Each day Princess updates their photo journal with more photos of other projects which are underway aboard the ship. Carnival Corp took delivery today of Carnival Magic at the Fincantieri shipyard in Monfalcone, Italy, bringing their fleet to 100 cruise ships in 10 brands. To mark the occasion, they released this composite photo of their first ship in 1972, the 27,250-ton Mardi Gras, sailing alongside the 130,000-ton Carnival Magic. 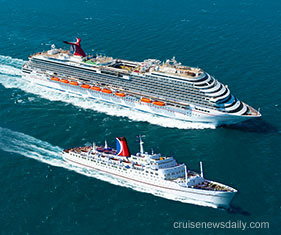 Mardi Gras carried 906 passengers, double occupancy, while Carnival Magic carries 3,690. Mardi Gras was 650 feet long with a 86.5-foot beam, and Carnival Magic is 1004 feet long with a 158-foot beam. Mardi Gras left the Carnival fleet in 1993. Carnival Magic will enter service on May 1. In today's video blog from the dry dock at Freeport, Martyn takes us behind-the-scenes again to talk with the project manager, Steve Storey, the man responsible for the entire operation from the beginning of planning 15 months ago to the moment the ship will leave the dry dock. Princess updates their photo journal daily with more photos of the work that has gone on that day aboard Grand Princess. Don’t you wish you had thought of this? 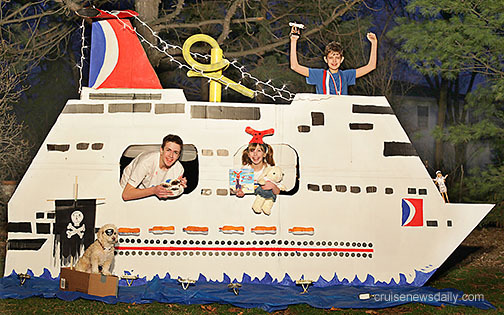 Carrie Duwelius of Naperville, Illinois turned a big piece of cardboard into a free ticket for four on a Carnival cruise. Actually, there was a step in between. First she made the big piece of cardboard into a rather flat Carnival cruise ship. Then that won the cruise for her on the yet-to-be-delivered Carnival Magic. Duweilius was the winner of Carnival’s Build a Ship out of Everyday Items contest. As you may remember, you could use anything to represent the ship. The more creative, the better. Photos were submitted to Carnival, and finalists were chosen and voted on by visitors to the website. Entries came in every variety of materials from piles of laundry to mattresses to aluminum cans to the winning cardboard. Of course everybody was a winner, because Carnival donated $1 for every entry to St. Jude’s Children’s Research Hospital, and they also donated $1 every time anyone cast a vote for a finalist. In today's update from the Grand Bahama Shipyard, Martyn takes us around Grand Princess to see how various venues are shaping up. There's more to see. Princess also keeps a photo journal with more photos of more work that has gone on that day aboard Grand Princess. In today's visit to Grand Princess in the dry dock at Freeport, Martyn again takes us to a behind-the-scenes function of the logistics team which is responsible for tracking everything coming to the ship for the work that will be done, and having it aboard when it's required. They also are responsible for removing all the material to be disposed of. Each day Princess updates their photo journal with new photos of additional projects underway aboard Grand Princess.